We recently passed another regulatory hurdle in the quest to build our Viking boat as authentically as possible. This time it was the Scarf Joints. 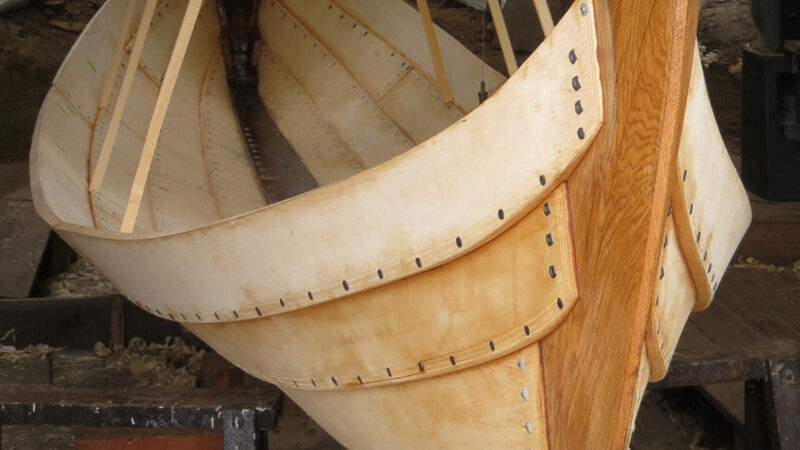 The construction of our Viking boat follows a traditional lapstrake method: overlapping planks lined up horizontally and riveted together along their length. Each row of planking is called a “strake”. 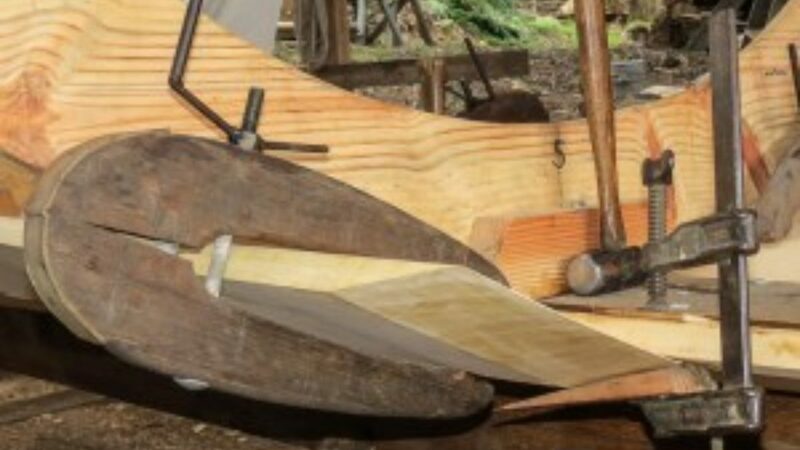 It’s near impossible to find a suitable single plank running the length of a boat our size so ancient ship builders – from before the Vikings developed a way of joining that relies on forcing together opposing tapered cuts on the ends of each plank. Joints like this are found everywhere today: house building, airframes, and of course wooden boats. Modern boat building practice calls for glue to be the way to connect and seal the ends together. But when you are trying to stay true to Viking boat form, rivets and pine tar are how it’s done. 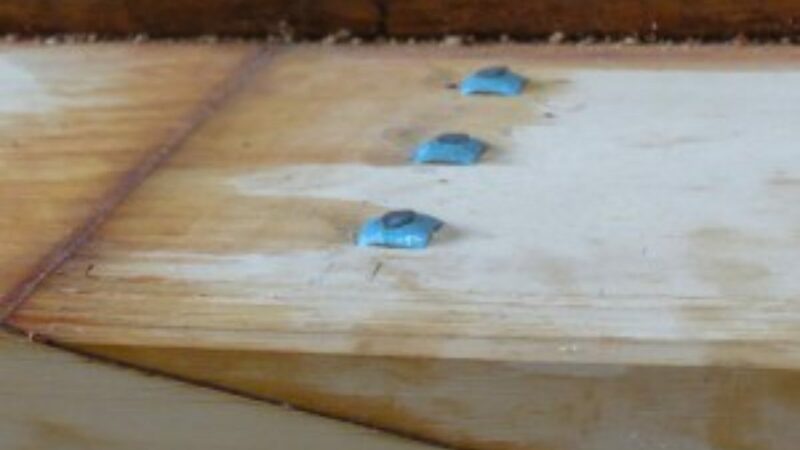 The rivets forming the joint are hammered into the plank in a specific pattern: an expert technique passed down from ancient boat builders and proven over time to provide more than adequate distribution of strength throughout the hull. For sealing the joint, a linen rag soaked in pine tar preservatives would be placed in between the two edges. This was done to prevent seawater from getting into the joint and the seam from rotting. Glued joints have become the norm given modern adhesives’ ability to make two boards as strong as a single plank. But boats have been built without glue for several thousand years. And while modern epoxies have excellent properties, it’s relatively new technology and not without disadvantages to using it in lapstrake hulls. One concern is that the thin spread of adhesive along the tapered surfaces to be joined can change the stiffness of the board. This significantly impacts the integrity of the boards holding the boat together. When Viking boats were built back in the day, their excellent seaworthiness was partly because their hulls were flexible: each plank gave a little bit in the waves; the whole system was resilient. In traditional Lapstrake construction from the Middle Ages, builders used a thickness ratio of 1:3 (a one-inch-thick plank would have a three-inch taper). For glue to hold effectively there needs to be a long tapered surface area: as much as a foot for every inch of plank thickness. The ends of a 12” taper become very thin – “feathery”, and vulnerable to physical damage. The traditional riveted joints pose a smaller risk of impact damage, because the shorter taper leaves an edge not as feathered and hence the joint is much more robust and the finished strake is more easily repairable if needed. For our boat to be as truly authentic as possible, we had to convince the U.S. Coast Guard to accept the Viking riveted scarf joint as passed down through millenia is an acceptable alternative to modern glued scarf joints. A riveted joint with roughly a three-inch taper is better suited for this application and just as strong. We also needed to make sure we didn’t land on any untested hybrids of the two. One challenge, which continues to arise the more we go along, is that hardly any written recorded data on these techniques exist. Fortunately, the coast guard inspectors at the Marine Safety Center in Washington, DC, had some very knowledgeable wooden boat-building experts who guided us. The excellent reputation of our lead shipwright, as well as solid testimony from the best known builders in Europe and USA all helped our case and after thorough review the Coast Guard gave us the go-ahead. It’s one more piece of authenticity maintained and another teaching tool. It’s one less compromise to be made with the modern way of doing things.